Gorgeous mountain views with lush greens and fairways await you for a round of 18-holes. Situated between Phoenix and Tucson, you'll enjoy country club living with over 165 activities like pickleball, crafts, tennis and more! Palm Creek is a true resort. The entrance is beautiful. We were greeted by helpful volunteers. After registration, a ranger led us to our site. My only complaint about the check in was in reference to where my dog was permitted to go. We had been traveling for several hours and doggy needed to go do business. While my husband was in registering, I was told the dog could not get out of the truck. Registration was not a quick process and the dog really needed to go. I think they should have a small doggie relief area at registration. They did strictly enforce where the dog could be walked. I have no problem with that, but when people are arriving most of the time everyone has been traveling for some time and the dog needs to be allowed out of the vehicle somewhere. The property is beautiful with so many ammenities. It does appear that this is mainly a snow bird and long term rental resort, but nightly rentals are welcome. Our back in site was on a gravel lot. The street is quite tight. The rsnger's help getting in was welcome. You do pay for the electricity you use over and above the nightly rate. It fid not amount to that big of a charge. We did enjoy iur stay here. The golf course was very nice. Stayed 3 months! Great place, great people and the activities are second to none. Learned to play pickle ball, stained glass and lapidary. The instructors are incredible. Can't wait to return. Extremely disappointed. While the RV spots are wide, the spots are all rocks and cement with a palm tree marking the spots boarders close to the road, thus I would give this park a 0 for appeal. 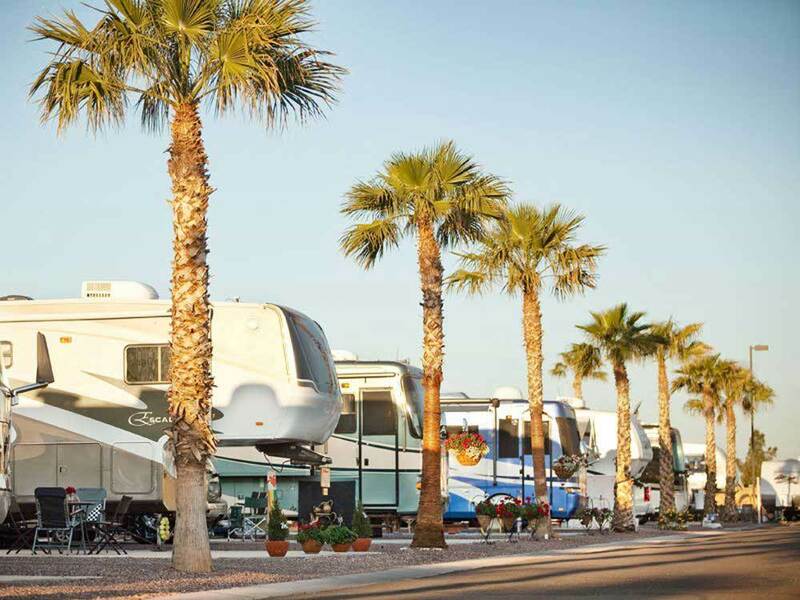 All the appeal is in this park is with the golf course which is blocked by unappealing manufactured homes.There is Wi-fi only in the laundry room and library, you have to paid Dish to install it in your camp site. While they have a lot of activities, you have to pay extra for everything. Truly one of the worst parks we have ever stayed at. The most shocking was how rude some of the people are. Great facilities and activities. The people and staff are outstanding. Came for a week and bought a site. A very common story here. Beautiful place. Just take a tour and you will see what I mean. Very friendly staff, and beautiful pool, as well as a very nice laundry area. This campground was a bit different in that campsites are mixed with 'vacation homes'. The streets are a bit tight, although beautifully paved and well marked. This site is gated and incredibly clean, but we don't think it deserves a 10/10/10 because it didn't have much of a camping-community feel. This is more of a second home camp-resort that happens to have some RV spaces. Also, even though the restrooms were nice, they were far from the campsites, so it's not a convenient walk unless your slot is near the clubhouse. Overall, a very nice resort with great fitness facility, laundry, and pool.